SAVE THOUSANDS NOW FOR SUMMER 2019!!! This House Rents SUNDAY to SUNDAY. Please Go To The Last Page Under "EXTERNAL LINKS" To See Our New Video. 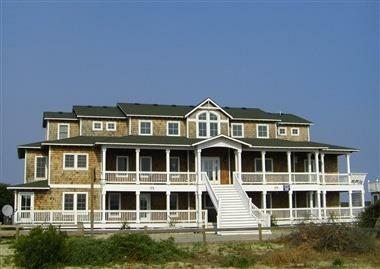 THE Hemingway is one of the most popular Vacation Homes in the Four Wheel Drive Area of Corolla. Truly Get Away From It All At "THE HEMINGWAY". Also check out on F a c e b o o k, type in "Carova Beach", Friend Us! CRYSTAL CLEAR DRINKING WATER Throughout The Entire House! We have the most advance TOTAL HOUSE Reverse Osmosis Water Filtration System in all the Outer Banks. A delightful contradiction of sorts, this oceanfront retreat is a trip back in time to the Hemingway era, yet extends a catalog of modern amenities. Whether you prefer an active daily schedule or seek peaceful relaxation, this home accommodates your vacation needs. Enjoy thoughtful design and views from almost every room! Approximately 2 miles up the beach. L1 : Four MBRs (K, K, K, K) two with whirlpools and one with handicap-friendly roll-in shower; two BRs (Q, Duo); full bath; rec room with surround sound system, small kitchenette, pool table, foosball and wet bar; exercise area; cabana half bath; decks; pool house with bar stools. L2 : Four MBRs (K, K, K, Q) one with whirlpool and one with handicap-friendly roll-in shower; large kitchen; great room; dining area; half bath; decks and covered porches. L3 : Four MBRs (K, K, K, Q) one with whirlpool; second family room with wet bar; captain's lookout with library; ocean-to-sound views; decks. Dogs welcome (1 max., no cats). Additional fee required. Pool may be heated upon request for an additional weekly fee of $250 (plus tax). Please contact our office in advance if you would like to make arrangements for this optional amenity. Private pool available April 28 - October 13, 2013 (heated option not available in July & August). Special Events welcome in 2013 for an additional $2,250. Please contact our office if you would like to make arrangements for a Special Event reservation. This House Rents SUNDAY to SUNDAY. Please Go To The Last Page Under "EXTERNAL LINKS" To See Our New Video. THE HEMINGWAY is one of the most popular Vacation Homes in the Four Wheel Drive Area of Corolla. This is a Remote Property and YOU WILL NEED A FOUR~WHEEL~DRIVE Vehicle to get to there! This 14 Bedroom Ocean Front Home sits atop 3 1/2 Acres of Sand and Dune. It was named after the famous author, Ernest Hemingway. It is decorated with Hemingway the era in which he lived. It's a delightful contradiction of sorts. When you visit this home for your Vacation With Friends, Family Reunions or A Wedding Destination, you'll forget your troubles and escape into a time long gone. "The Hemingway" has all the modern conveniences such as Wi-Fi, Direct TV Flat Screen TV's and Viking Kitchen Appliances. This house if Totally Handicap Friendly complete with Elevator and Step-less Ramp All The Way To the Dune-top Gazebo. It is appointed with comfortable beds, Knotty Pine Floors, Porcelain Floor & Wall Tiled Bathrooms and Granite Counter Tops Throughout. This house was built like no other and cost cutting was not an option. You'll feel the quality the minute you walk through the doors. This Retreat offers a Wooden Boardwalk to the Beach complete with Gazebo and Seating to look onward to the Beautiful Atlantic Ocean. Large Heated Pool, Pool House with a Kitchen Sink and 32" Plasma TV. Stage Area for Sunning or Entertainment Location (Band), 300' Boardwalk to the Beach, Large Gazebo w/Seating Overlooking the Atlantic Ocean. Basketball Goal. We Rent Four Wheel Drive Vehicles to our Guests, Very Reasonable! Low Rate for 4x4 Rental. 1st Come 1st Serve Basis so Book Now! Please come prepared, you must drive a Four Wheel Drive Vehicle to get to this Wonderfully Secluded Property, even though you'll only need it for about two miles once you leave the hard surface road. "IF YOU DON'T HAVE A 4X4, WE DO AT A VERY REASONABLE RATE!! (Subject to Availability, 1st come first serve) Less than Four Miles from the House you will find; Food Lion, Cinema IV Theatre, Gas Station, Novelty Shops, Currituck County History Museum, Segway Tours, Horse Tours, Go-Cart Track, Bumper Cars and Tons of Great Restaurants! BE SURE to note, you will need a FOUR WHEEL DRIVE VEHICLE to get to the Estate Home. WE RENT FOUR WHEEL DRIVE VEHICLES!!! BE SURE to note, you will need a FOUR WHEEL DRIVE VEHICLE to get to the Estate Home. We Rent Four Wheel Drive Vehicles to our Guests, Very Reasonable! Low Rate for 4x4 Rental. 1st Come 1st Serve Basis so Book Now! We stayed at Sea-duction for a week with Our family and the house was perfect. Loved the size of pool and the sand pit for volleyball. I feel that the living area could have been larger for us, but we appreciated the elevator for bringing groceries to the 3rd floor. All bedrooms were excellent. Loved the location, 1 block from ocean. We cooked a lot and the kitchen had everything we needed. Really loved the 2 gas grills. Used them both. Loved how each bedroom had access to the pool with all the stairs on the outside. Very convenient. Would definitely recommend this house. Thanks so much. We had a great time at The Hemingway. Home was spacious and well dsigned to allow everyone space and privacy. The common areas accommodated our group of 24.for meals very well. The location was great. We saw horses and dolphins almost everyday without leaving the property. Chuck the landlord and Shane his right hand man were so accommodating. Truly need 4 wheel drive (not all wheel) to come and go. Pool and beach were great and allowed for easy back and forth depending on our mood. Bring fresh water as well water is a bit salty. (Common in the area) . Family Fun for sure. This was my family's 2nd reunion together; the first was a week stay in a beach house on Virginia Beach. This house was a first-rate improvement, compared to the other, and we enjoyed every moment of our stay here. The Hemingway was cozy, spacious and fun. The floor plan was laid out wonderfully. The rooms were decorated nicely and provided amazing views of the ocean throughout the house. Thanksgiving was the best as the wild horses grazed in the backyard during the entire day. Although, accessing the home was a challenge, we are all happy to have captured the experience of vacationing at the OBX and staying in The Heminway. Thank you Chuck for an amazing vacation stay. This is our fourth trip to The Hemingway. We love it and will be back again and again! The Osborne Family.